The Safety Net project began in 2009 with funding from the Department of Health. It aimed to prevent the exploitation of people with learning disabilities, by those claiming to be their friends, and dealt with issues around mate crime. Mate Crime is where some people pretend to be friends with someone who has learning disabilities but then go on to exploit them. Many people with learning disabilities have ‘friends’ who go on to abuse them. This has led to people losing their independence, financial, physical and sexual abuse, exploitation … even murder. The project created awareness of these topics for people with a learning disability, carers, professionals and the wider community. looked for contacts for any similar projects locally or nationally in an effort not to reinvent the wheel. There were two pilot groups; one in North Devon (Project Officer Rod Landman) and one pilot group in Calderdale (Project Officer David Grundy). The pilot groups worked locally with people who have learning disabilities, the police, community leaders, safety partnerships and local partnership boards. Safety Net recorded the work of the pilot groups so that others can use it. The pilot groups both had several meetings and gathered evidence of exploitation from the local areas. The biggest finding, from talking to the pilot groups, was that people with a learning disability struggle to recognise when they are being exploited. There have been cases where a person is being exploited but is convinced that the exploiter is their friend. Most of the evidence of mate crime that we gathered for this project came from third party reporting. Safety Net developed local strategies and protocols to support and protect people with learning disabilities with issues of mate crime. The project helped to raise awareness within the local communities. The two pilot areas also developed training for people with learning disabilities about friendship and training to raise community awareness. Safety Net took part in local media campaigns that included radio interviews, newspaper articles, posters put up in the local areas and a video was made about the Safety Net March about mate crime as part of Learning Disability Week 2011. 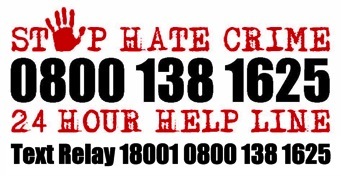 Research into scoping the size of the problem locally and nationally and keeping abreast of developments within the areas of hate crime, mate crime, exploitation and abuse is ongoing. We believe that the current statistics on hate and mate crime against people with learning disabilities are just scratching the surface and we need to continue to raise awareness of what mate crime is so that we can fully understand the size of the problem. The original Safety Net project was funded by the Department of Health. The current Safety Net Train the Trainer project is funded by the Home Office (CIF), Devon and Cornwall Police, Devon County Council and the Royal Devon and Exeter Hospital.